Post researched and written by Emma Scott, Collections Assistant. Minutes of annual meetings held 1862-1870, 1874, 1883, 1884, 10 October 1865, Otago Chamber of Commerce Records, UN-022, Hocken Collections / Uare Taoka o Hākena. The “leading chinese merchant in Melbourne” appears to have been Lowe Kong Meng. There is evidence of his deputy Ho A Mee arriving in Dunedin in December 1865 on the South Australian to inspect the mining districts of the province. Five days after the Otago Daily Times had reported Ho A Mee’s visit, five Chinese passengers were reported to arrive in Port Chalmers from Melbourne on the ship Otago. In the meeting the following year, on 2 October 1866, the minutes state that “upwards of a hundred Chinese have settled in the gold districts, and are working harmoniously with the European population; and as it is understood they are satisfied with the prospects offered by this province.” . Some of the Chinese miners who moved to Dunedin joined the Chinese community established in the area of lower Walker (now Carroll), Stafford and Hope Streets. This area was known as “Tongyan Gai” or “Chinese street” to some of the Chinese who lived there. 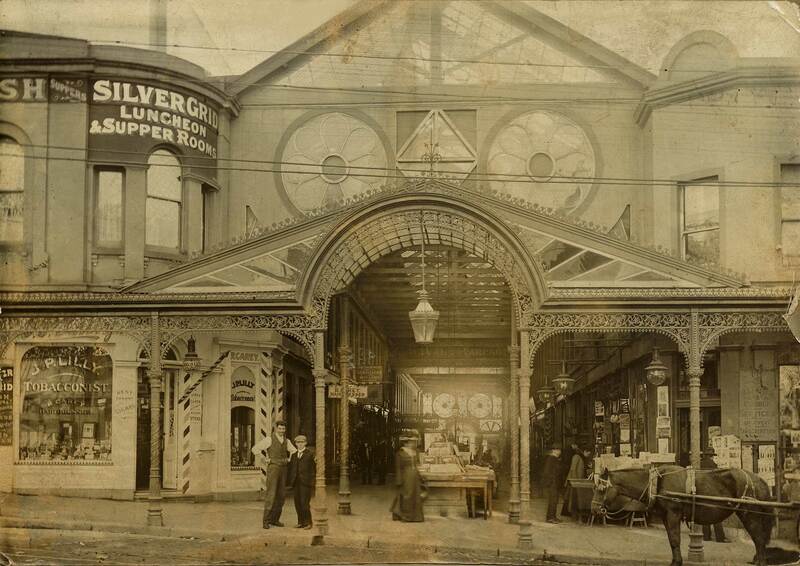 This area was popular because the accommodation was cheap and was also a place of work where laundries, grocers, greengrocers and fruiterers were located. This area also had “minimal facilities, dirt, gambling dens and brothels” and was called the “Devils Half Acre” by Europeans , unfortunately this led to some negative perceptions of the Chinese community. 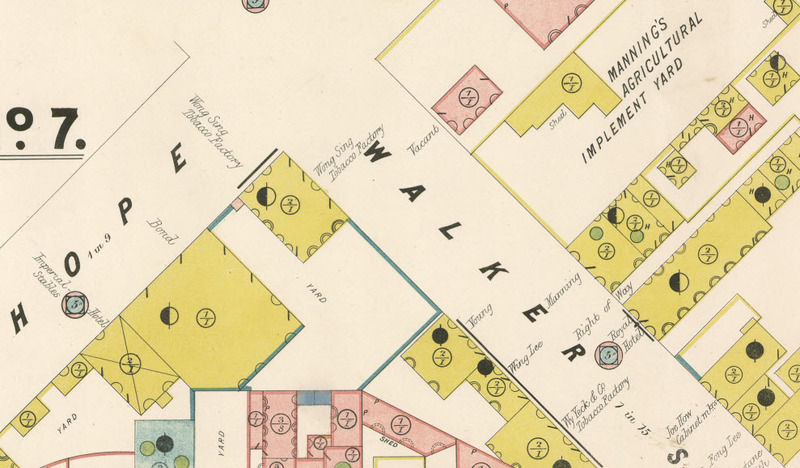 In the block map below dated around 1888 you can see some of the Chinese merchants located in Walker and Hope streets, including Wy Yeck and Wong Sing Tobacco Factories, and Joe How Cabinet Makers. Stones Otago and Southland Directory also lists some other Chinese merchants located in Maclaggan Street, Rattray Street and in Farley’s Royal Arcade, located in the block between High Street and Maclaggan Street. The Royal Arcade from High Street. Hocken Archives UN-029 box 190. The photograph below of St Kilda dated around 1905 shows some cultivated land where some of the gardens were located. Hocken Snapshop (10th Jul 2012). 1054_01_023A.jpg. In Website Hocken Snapshop. Retrieved 19th Apr 2018 11:40, from http://hockensnapshop.ac.nz/nodes/view/9802. If you open this Hocken Snapshop link you can zoom in and see Chin Fooi’s laundry at 162 Rattray Street, which was established in the 1920s. 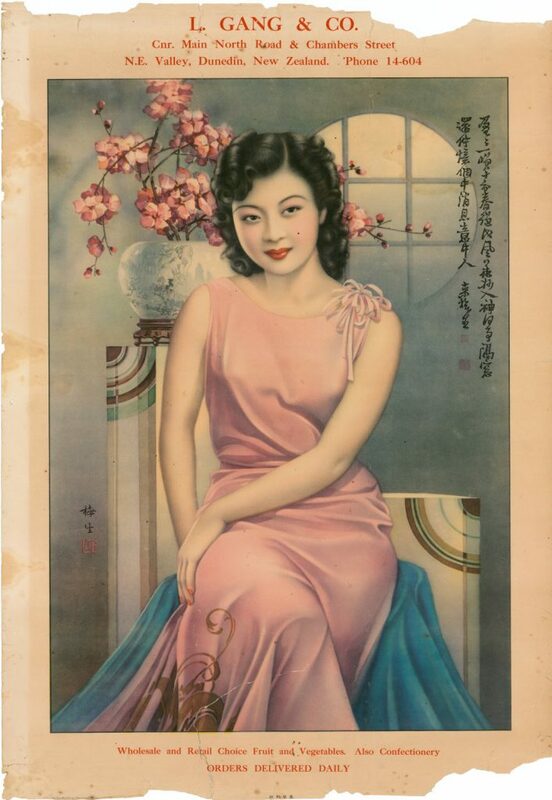 Advertisements and flyers for Chinese businesses are hard to come by, but in our posters collection we hold an advertisement for L. Gang & Co. Fruiterer that was located at 108 North Road on the corner of Chambers Street (where the Jumbo Dairy is now). According to the Stone’s Otago and Southland Directory, L. Gang & Co operated in this location from 1941 and continued to be listed there until 1945, from 1946 it became Wong & Co. Fruiterers. If you have any information about this business we would love to hear from you. Gang & Co, Hocken Posters Collection. 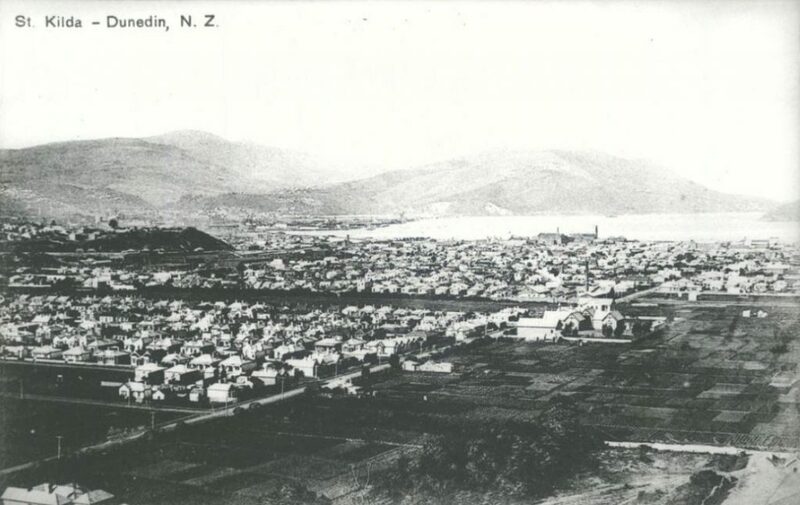 Inviting the Chinese to immigrate to Otago had a significant impact on the region as the Chinese community played a “major role in the economic and cultural development of the province” and helped establish Otago as a commercial centre. It is excellent to see some acknowledgement of the Chinese community with the Dunedin Chinese Garden opening in 2008 and a Rattray Street mural depicting businessman Chin Fooi painted in 2015. The history of Chinese communities in Otago and Southland is a broad and fascinating topic, if you would like to learn more, I would highly recommend reading Dr James Ng’s set of books, Windows on a Chinese Past, which we hold at the Hocken amongst other fantastic resources on this subject. Minutes of annual meetings held 1862-1870, 1874, 1883, 1884, 10 October 1865, Otago Chamber of Commerce Records, UN-022, Hocken Archives. Evening Post (Wellington), 27 December 1865. “Shipping”, Otago Daily Times, 25 December 1865. James Ng, “The Otago Chinese Goldminers: Factors that helped them survive”, in Rushing for Gold: live and commerce on the goldfields of New Zealand and Australia, ed. Lloyd Carpenter and Lyndon Fraser (Dunedin: Otago University Press, 2016), 101-121. Minutes of annual meetings held 1862-1870, 1874, 1883, 1884, 2 October 1866, Otago Chamber of Commerce Records, UN-022, Hocken Archives. James Ng, “The Sojourner Experience: The Cantonese Goldseekers in New Zealand, 1865-1901”, in Unfolding History, Evolving Identity: the Chinese in New Zealand, ed. Manying Ip (Auckland, Auckland University Press, 2003), 12. J.M.A. Tuck, “The Devil’s Half-Acre: 1900-1910” (B.A. Hons diss., University of Otago, Dunedin, NZ, 1983) 10. Niti Pawakapan, “The Chinese in Dunedin between the 1920’s and the 1940’s” (M.A. diss., University of Otago, Dunedin, NZ, 1987) 10-58. David Fung, Turning stone into jade: the history of the New Zealand Chinese Association (Wellington: New Zealand Chinese Association, 2014), 109. “Artists still making their marks”, Otago Daily Times, 25 May 2015. Paul Macgregor, “A Trade in Chinese Men and Supplies: Lowe Kong Meng and the organisation of the Chinese gold rush in Otago”, in Rushing for Gold: live and commerce on the goldfields of New Zealand and Australia, ed. Lloyd Carpenter and Lyndon Fraser (Dunedin: Otago University Press, 2016), 133-147. Pauline Rule, “The Transformative Effect of Australian Experience on the Life of Ho A Mei, 1838-1901, Hong Kong Community Leader and Entrepreneur”, in Journal of Chinese Overseas, ed. Zhou Min and Liu Hong (Leiden: Brill, 2013), 107-134. This entry was posted in Archives and manuscripts, Ephemera and posters, Migration by Hocken Collections. Bookmark the permalink.